Production software for manufacturers, job shops, and custom fabricators. Encompassing everything from Quoting to Accounting and everything in between. Perfect for conference and event organisers, not for venues. Summit Event Manager: An MS Access desktop application that gives you complete control over every detail of your events: attendee registration, travel and lodging arrangements, budgeting and finances, meals and seating, badges and tickets, exhibitions, sponsors, correspondence, reports and more. Plus an optional internet registration feature. Open code means you can customize features and build entirely new functions. 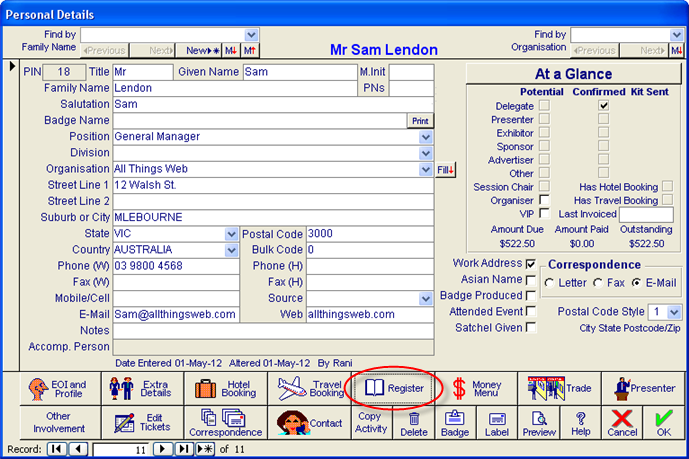 Pros: I have used Summit Event Manager Pro since its release onto the Australian Market and, in comparison to other, far more expensive, event management programs find it extremely user-friendly and with all the features I have ever needed for the management of an event (the events my company manages vary in size from 100 to 2,500 delegates). Delegates find it simple to register using on-line registration and reports - which are all tailored to client-specific requirements - are very simple to produce. It handles everything from budgets, speakers' requirements, table allocations, running sheets, badges to the final financial outcome really easily. If I need to change any of the features specifically for an event or to meet a client's requirements I can do that too. Running a conference (October 2008) in Sydney, Australia for 2,100 international delegates in 'real time' with Summit was simplicity itself. Cons: The current version requires interface with a programmer to design in or make changes to on-line registration forms if the 'standard' provided isn't adequate - hopefully this will change in version 10 which is to be released in early 2010. Overall: The most cost-effective event management program currently available - and it's a complete package too. Other - vastly more expensive - programs are supplied in modules none of which quite seems to do the job without investing more money in yet another bolt-on. The service back-up is second to none and the MIE Software staff are both knowledgeable and friendly. Overall: Summit Event Pro is exetremely comprehensive and easy to use. I would certainly reccommend this software to any PCO or inhouse event company. Cons: 1. The lack of availibility to create customise reports and doucumentation in current version. This is not the case in the new Version11. Overall: The Summit event management software package is far greater package to use than Events Pro. Having used Events Pro, the clunkiness of it operation coupled with its stability issues make the software frustratiiong to use. Summit provides great, simple to use functionality, that makes it ease to use and train new staff members entering the evnts industry. Comments: Pros: Summit Event Manager is an extremely user friendly system. This is a product that can be used with ease and confidence, and MIE Software have created the program keeping in mind that the majority of PCOs are not IT experts! SEM has an extensive list of reports, however if you can't find what you're looking for John and Kaye from MIE are able to whip one up for you in no time at all. Although many (or almost all) of the competitor's event management programs seem to be online these days, we prefer using a desktop program for a couple of reasons. One being that we like to be in complete control of our files, and couldn't think of anything worse than having delegates log on and change their registration details at any time they wish! Secondly, we run events all over the world and quite often we will not have an internet connection, for example on a cruise ship. My favourite functionality would have to be the running sheet, which is frequently referred to as the 'Event Bible' whilst onsite! Cons: Absolutely none. If I have ever found a con I have notified the MIE team and they have given me a solution straight away. Overall: We have been using Summit Event Manager for over 12 years now and will continue to be a loyal user for many more years to come. Pros: We have been using Summit Event Pro for many years and found it more than meets our needs for Event Management. The Technical Knowledge of John and his team are fantastic and their personal level of service is a real asset. Constant improvements have been most welcome and very useful - John responds well to feedback regarding any issues and is able to improve the product to meet any apparent shortcomings with a minor update. Cons: Only one I can think relates to hotel bookings - if someone is checking into a hotel then returning at a later date the only way to ensure correct room nights is to create a 'new' hotel for the second stay - this has not been a real issue for us though. Overall: A great product from a Company who have a real passion for software development and ongoing improvements - nothing is too difficult and they have always been able to fix something I have stuffed up! Comments: Summit has expanded my skill set for clients and put ease on my job role requirements by providing efficient and effective processes to event timelines . The program enables extensive reporting that would normally take hours to do manually. I find the software easy to navigate and compatible with almost any event not just your standard conference. It would be great to see a method of importing delegates through Excel other than using the online registration set up that allows you to import all details not just personal details. Overall my dealings with MIE software have been professional and I find the team a pleasure to work with. They are quick attentive and seem to have the answers to all questions/ problems. I highly recommend Summit to anyone in the industry seeking a solution to all of their event planning needs. Summit is not about working hard it is about working smart! Thanks John, Kay and Amanda for the recommendation, very impressed so far! Pros: The Summit Event Manager has been intergral to the success of our business. The program is easy to use and allows us to handle the most complex of international travel/event movements that we regularly manage. The reporting we receive is second to none and allows us to manage the big picture as well as minor details so that nothing is left to chance. Overall: We really have to rate this software program as 10 out of 10. Don't be put off by tyhe low cost of purchase, it is far more effective than other software programs that come with significantly bigger price tags. Comments: We have used Summit for nine years now. Each year I have found another function of the program that I have add to my use. Once you put something in the program, you don't have to make yourself a separate reminder. You can data mine whatever you need very easily and transport out of Summit to any other programs with ease. We are a health care delivery company that puts on a Symposium every year for approximately 200-250 attendees. There are so many moving pieces and Summit keeps them all together. I gave customer service a 4 out of 5, only because I wish they were available on my time zone! However, this year, John Clingeleffer went above and beyond to come to work early, to log into my computer and help me solve my issues. He was truly amazing, and sorted out my program rapidly. Pros: We have used Summit Event Manager to manage our events for six years and it has become an invaluable tool for our business. Overall: Excellent product that offers value for money, is intuitive to use, very robust, has excelllent reporting tools. Pros: Has many features to assist with every aspect of event management. The reports are numerous, can be tailored to a specific requirement and are easily exportable to standard office software. It is easy for new staff to pick up and is simple to use in conjunction with our own on line registration system. Cons: Sometimes there is a limit to it's flexibility to adapt to a specific program with unusual requirements. Overall: Summit is easy to use, affordable and with excellent technical support. We have been using it for over ten years. Pros: Summit is very intuitive - you don't need weeks of training to understand it. It covers sponsors, trade, presenters, flights, travel, accommodation, delegates, tax invoices.... everything we need. The team at Summit are VERY receptive when you need special reports or assistance! We love dealing with them. Cons: Have very occassionally had problems with data files when we have lost power or something like that and the file hasn't been shut down properly. Pros: We use it extensively, including back office / reconciliations. Does everything we want and never a problem in getting support Support team are very helpful and we will purchase SEMP 11 as soon as it is available. Pros: As the second user of Summit in Australia some ? 13-14 years ago (I think! ), I have used it constantly for all of that time. I then became a Trainer, and a Re-Seller. The product is excellent. The Developers are amazing, and the Support I have always received has been 6 star! I have absolutely no hesitation whatsoever in recommending ALL facets of this excellent product. Couldn't have survived without it!! Pros: The product is easy to use and the support is always fantastic - helpful and friendly. Cons: Misses some features, but MIE will always try to provide what is missing, and the new software, which I haven't got as yet, addresses the issues. Overall: For anyone considering purchasing event software, I'd recommend Summit Pro 100% - it's easy to use, does what you need it do, and if it doesn't, they'll modify it for you, and it's a reasonable price.